When people talk about San Francisco's Fisherman's Wharf, the first things that come to mind are sourdough bread, sidewalk food stands, souvenir shops, and (maybe) chocolate. It didn't start that way. Fisherman's Wharf was once home to a fleet of more than 400 fishing boats. You still see pictures of them on postcards and social media feeds with names like Lucky Lady and Pico - and Golden Gate. Those few are all that's left of the old fleet. Locals turn up their hoity-toity noses about Fisherman's Wharf and complain that it's all fake. Frankly, the San Francisco icon is getting a bit tired. In spite of that, most visitors feel they haven't seen San Francisco unless they go, even if they decide that it's overrated after they go there. Restrooms are hard to find at Fisherman's Wharf but don't start squirming yet. You can find public restrooms across Taylor Street from the sidewalk seafood stands. You can also find them at Pier 39, The Cannery and Anchorage shopping centers, and at Ghirardelli Square. Fisherman's Wharf is about halfway between the Golden Gate and Bay Bridges. The historic "F" waterfront trolley goes there, and the cable car stop at Mason and Bay (about a block away) is less busy than the one at Hyde Street below Ghirardelli Square. If you're driving, expect to pay exorbitant rates for parking. Scarce parking meters have a one-hour limit, and non-metered spots require a resident permit. If you park in this area, you should also know that it's one of the worst places in San Francisco for car break-ins. Don't leave anything tempting-looking in sight - or even better, take all your valuables with you. Technically, Fisherman's Wharf is between Pier 35 and Aquatic Park along the San Francisco waterfront. That area includes Pier 39, but there's so much to do there that it deserves its own list: the guide to seeing Pier 39. Many things to do at Fishermans' Wharf are free, but it's worth looking into a discount card if you want to visit the ones that charge admission. Check out the in-depth evaluations of the San Francisco CityPASS and the Go San Francisco Card. Keep reading. 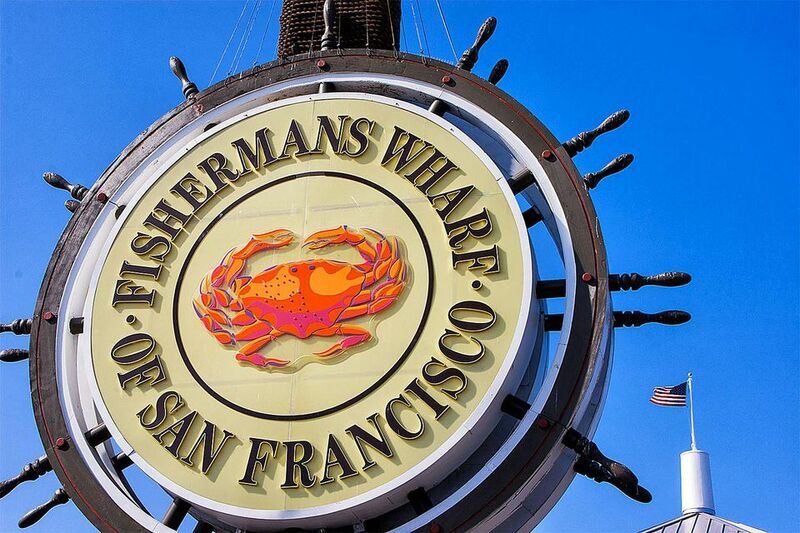 Because you're a smart visitor who read all these tips, you'll know where to find the authentic side of Fisherman's Wharf and can surprise your traveling companions with your knowledge. The Wax Museum at Fisherman's Wharf has been a fixture since 1963. Like Ripley's down the street, it's one of the places that people either like or hate. And one person's tourist trap is another person's don't-miss sight. It's at 166 Jefferson Street. Hopefully, you know which kind of person you are when it comes to places like this. Find out more at the Madame Tussaud's San Francisco website. Ripley's holds two floors full of weird stuff, oddities and the truly unbelievable, like that "genuine" two-headed cow. Opinions about it are so divided that it could be called "Like It Or Not," with some folks finding it fascinating and others thinking it's "cheesy and touristy." It's also located on Jefferson Street, across from Boudin Bakery. You can get hours and prices at the Ripley's San Francisco website. Sourdough bread has been made in San Francisco since the Gold Rush, but nowadays it's synonymous with Boudin. The bakery at Fisherman's Wharf sells loaves of the famous bread and has a full-service restaurant upstairs. They also offer daily tours, and you can see the bakers at work through a big window facing Jefferson Street. Their hours and tour times are on the Boudin Bakery website. This rotating sign marks the piers where the Red and White Cruise line leaves for their harbor cruises, which are one of the way to take a San Francisco Bay cruise. These two World War II icons are docked at Pier 45, next to the Red and White Fleet dock. The big boat is a World War II Liberty Ship, one of 2,710 built during the war. Of all those, it's one of only two fully-functional ships left and is the last unaltered one. Tours are given daily, and she goes out for cruises during the annual Fleet Week event in October and at other times. Find out more at the SS Jeremiah O'Brien website. SS-383 is a World War II Balao class Fleet submarine which sank six Japanese ships during her career in the Pacific. It's open for tours seven days a week. Their hours are on the Pampanito website. The Musee Mechanique is so much fun! It's full of old-fashioned arcade games and curiosities, which you might think would be boring, but they still seem to charm even the most jaded of kids (and adults). Here's how to have the most fun: Don't just stand there looking at all those funky old machines. Instead, find the nearest change machine, get a handful of quarters and drop them into any machine that catches your eye. ©2004 Betsy Malloy Photography. Used by Permission. At the corner of Jefferson and Taylor, the sidewalk is lined with little takeaway food stands. They sell crab, shrimp and other seafood. During crab season in November, you may be able to get a fresh one then if you ask for it. The rest of the year, they've been frozen before cooking. If you buy a cooked crab on the wharf, ask them to clean it for you; then you can take somewhere nearby for an impromptu picnic, to eat with that loaf of sourdough bread you just bought at Boudins. Those postcard-perfect boats you've seen at Fisherman's Wharf are just past Taylor Street. You'll also find a few other boats docked there that can take you out for a sightseeing tour or a fishing trip. After you've seen that tourist part of Fisherman's Wharf, take a couple of minutes to see the more authentic part of it, behind those colorful boats. Follow the walkway toward the piers that runs next to the restaurants. This little chapel was built in 1981. You may also find fishermen working on their boats, and you're almost guaranteed to meet a few seagulls. If you're lucky, they won't drop anything white and stinky on you. If that happens, be strong and wait until it dries. It's much easier to brush off then. Keep going toward the bay to find the commercial fishing pier. The contraptions you may see piled up on the dock are crab traps. To see boats bringing in their catch, go EARLY, about 6:00 to 7:00 a.m. Walk back to Jefferson to continue your visit. Located on Pier 37 at the end of Al Scoma Way, Scoma's restaurant is said to be one of the country's most profitable eateries. You get there by walking down Al Scoma Way from Jefferson. This photo was taken from the back of the wharf, the area you just explored. You can see Scoma's fishing boat in the foreground and the Golden Gate Bridge behind. But that won't keep some of you from wanting to eat there anyway. To make the best of what's available, use the guide to eating in a Fisherman's Wharf restaurant. Sometimes called Hyde Street Pier because of its location, the Maritime Historic Park is a collection of historic ships, including a square-rigger "tall ship" called the Balclutha, an 1890 steam-powered ferryboat, and a paddle wheeler. In the fall, they present a sea music concert series, with performers singing chanteys and seafaring ballads aboard the Balclutha. The ships are on the waterfront near where Hyde Street ends at Jefferson Street. The visitor center is at the corner of Hyde and Jefferson. You can find out more about the museum at the Maritime Park website. The intersection of Hyde and Beach Streets above Fisherman's Wharf has something to see on almost every corner. To get there, walk up the hill from the Hyde Street Pier to Beach Street. The end of the Hyde Street cable car line is at Hyde and Beach. You can get good photos of the cars there, of people boarding and the drivers turning the cars on a big turntable, but the lines can be maddeningly long. The only reason to wait in them is if you want to ride up Hyde to get off at the top of Lombard Street. Otherwise, you'll have a shorter wait if you walk just a few blocks to the end of the Powell line at Taylor and Bay. It goes to the same endpoint near Union Square. Here's what you need about know about how to ride a cable car. You'll usually find street vendors along Beach Street. They sell jewelry, souvenirs, and small decorative items, their prices are reasonable, and quality is good. The hot coffee and whiskey drink called Irish coffee made its U.S. debut at the Buena Vista Cafe, and they still sell them by the hundreds. It's at the corner of Hyde and Beach, just above the cable car stop. Find out how that concoction got to San Francisco and what all the fuss is about. Just below Ghirardelli Square, this protected cove looks like a fine place for kids to play. Members of the Dolphin Club and Southend Rowing Club swim there nearly every day, but sfwater.org reports that water quality sometimes fails to meet state standards. The grassy area above the water is a nice place for a rest, a romp or a photo op. Fourth of July fireworks go off from the end of the pier. Ghirardelli is undisputably famous. It may have seemed extraordinary in 1950 or even 1980. Today, it's far from the best place for chocolate in San Francisco. If you're a serious chocoholic, try these best places for chocolate lovers to get a sugar rush in San Francisco. Ghirardelli Square is just another place to shop for souvenirs and decorative items, and you can buy their chocolates almost anywhere in town. Or even at a local grocery store. Get more information about it at the Ghirardelli Square Website. Domingo Ghirardelli came to San Francisco during the 1849 Gold Rush, making his fortune not by mining gold but by selling chocolate. Today's Ghirardelli Square was built as a wool fabric factory in 1864. The Ghirardelli Company moved there from Jackson Square in the late 1890s. Don't let the name "Manufactory" confuse you. The chocolate factory is elsewhere, and there is no factory tour, but you can shop in the gift shop, which sells chocolate in San Francisco souvenir packs. For a chocolate fix on the spot, stop by the dessert and coffee cafe. But know your sweet tooth first. Some people call their specialty sundaes are "large, indulgent scoops of heaven." Others think they're gooey and too sweet.